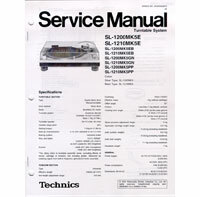 Technics Service Manuals for SL1200 Series DJParts - All Variety of Parts that DJ Needs. The SL1200/1210 MK5's Service Manual. Complete with electrical and parts diagrams, as well as disassembly and repair instructions for the tonearm, LED Pop-Up light replacement, Drive Coil assembly, and more.